Click or swipe through the gallery above to see every Journey to Un’Goro card shown so far. We will be updating this list as more are revealed. Hearthstone’s next expansion is the prehistoric-themed Journey to Un’Goro, primed to add 135 new cards to the game in early April. 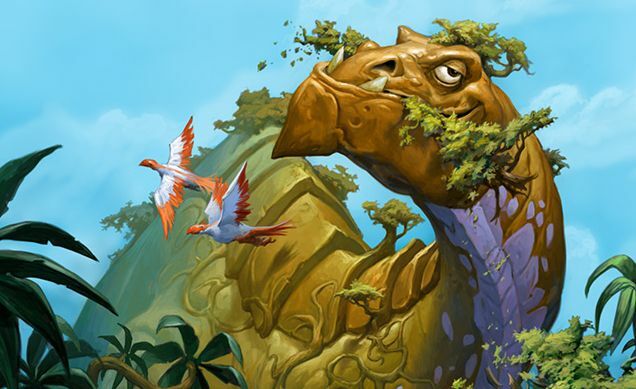 The set is filled to the brim with dinosaurs, elementals, and killer plants, with each class focusing on one more than the others—and Un’Goro could end up being Hearthstone’s most important expansion yet. In addition to elementals getting a tribal tag of their very own, Un’Goro will be adding a brand new keyword to the game: Adapt. When a minion Adapts, you will be given a Discover style choice of three buffs from a possible list of 10, ranging from extra health, to extra attack, to Taunt, and pretty much any other effect you can think of. We’ve already seen a fair amount of what the set will have to offer, with more new cards being shown every day as we ramp up toward Un’Goro’s release. We even got to reveal our own card and take a look at all the old cards that will be joining the Elemental tribe. The expansion is sure to shake up the meta, and will likely cause ripples in our list of the 25 best Hearthstone legendaries. Check out the cards in the gallery above, and be sure to check back here regularly for all the new reveals!